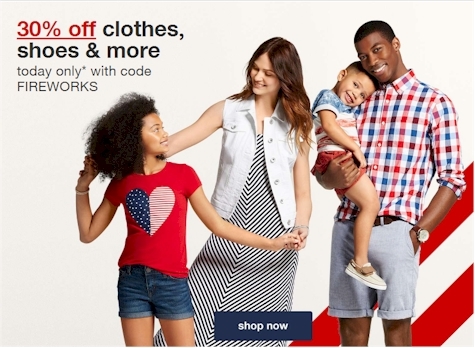 Get 30% off clothing, shoes and accessories when you enter promo code FIREWORKS at checkout, today, 7/3/16 only. If you want to use this offer in-store instead of online, you can get it via these 30% off Cartwheel offer. Today and tomorrow, 7/3/16-7/4/16, get a FREE $10 Target gift card when you spend $50 on food & beverages when you enter the promo code GROCERY at checkout. If you want to use this offer in-store instead of online, you can print out a coupon for this offer here.